In which I continue to violate your childhoods. The safety curtain labeled “assbestos” isn’t the half of it — this is one of those cartoons it’s probably best to dismiss as a bad dream. This is the Mickey Mouse cartoon Uncle Walt probably doesn’t want you to see. It doesn’t seem to be included on the DVDs collecting the rodent’s b&w adventures. Along with SONG OF THE SOUTH, which is positively unproblematic by comparison, this has been, er, whitewashed from history. SONG OF THE SOUTH, the Disney feature with the most worrisome rep, is certainly a quaint and disingenuous view of the south, and again features a certain amount of racial stereotyping. But I’ve always felt a certain fondness for it — despite the unwelcome revelation that Gregg Toland’s genius kind of evaporated when he shot in Technicolor — as a kid, I’d see Uncle Remus singing Zippedy-do-dah in all those TV specials, and I liked him. And I realized much later that I hadn’t even perceived him as ethnically different from myself. He was just an old man. So I can kind of feel the innocence in the film’s depiction of race. Should I attempt a Leonard Maltin-style defense of the above?I could say, “OK, *you* do a caricature of a cannibal that isn’t racist!” but I don’t think that would wash. While Buster Keaton’s cannibals in THE NAVIGATOR aren’t grotesque distortions of humanity like Disney’s, they still partake of a rather limited view of African civilisation — cannibalism has always been very much a niche activity in reality, so part of the racism is in depicting it so frequently. I don’t demand it be portrayed sympathetically… and I can’t stay mad at Buster. 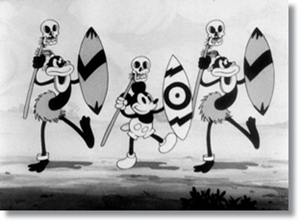 At least Mickey befriends the natives, rather than defeating them in a warlike manner. Maybe, after the chief tragically suffers 90% scalding in the final shot, Mickey joins them in their life of anthropophagy, perhaps even taking over the tribe like Martin Sheen at the end of APOCALYPSE NOW. With Pluto as a kind of canine Dennis Hopper. But really, all possible allowances aside, I do think this is (you should pardon the expression) rather beyond the pale. Words from The Narrative of Arthur Gordon Pym by Edgar Allan Poe. 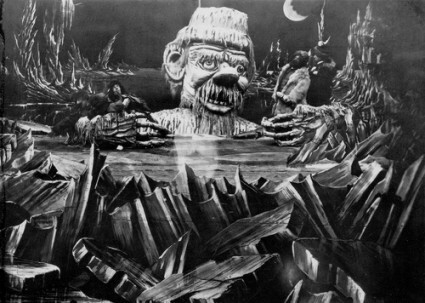 Image from THE CONQUEST OF THE SOUTH POLE by Georges Melies. Given Le Grand Melies’ habit of adapting Verne, with a dash of uncredited HG Wells, it doesn’t seem impossible that Poe was on his mind while knocking up this caper. It may have been the first Melies I ever saw, extracted in a Killiam compilation screened on TV. I think I already knew about KING KONG and stop-motion animation, so it was fascinating to see a giant monster produced using the technique a child (or naive adult) might assume had been used on the big gorilla: a bunch of people piled together in a suit. Well, Melies’ monster is more like a machine than a costume, the support structure and apparatus being more important than the human element. Interestingly, despite what might seem my relative sophistication at the time, I don’t think I grasped the implications of the Ice Giant being mostly concealed below the horizon line: I assumed Melies had constructed the entire creature from head to toe. Also, I didn’t question the strange perspectival implications of his arising from beyond the vanishing point. So, we finally got around to THE ARTIST, crowding into Cameo 2 with a bunch of other elderly people — I do think it’s nice when a movie attracts an audience that doesn’t normally venture into the dark. Immediately a commercial for Red Bull got a big laugh, so we knew we were surrounded by people who hadn’t seen a film at the cinema for at least a year. Ah, the polite laughter of the middle-class! The laughter that says, “I understood that, and I approve of the sentiment.” I don’t mean to be harsh: I value politeness, understanding and approval. I don’t think of them as a form of humour, though. THE ARTIST has some cute jokes, and some clever moments, but felt awfully thin to me. 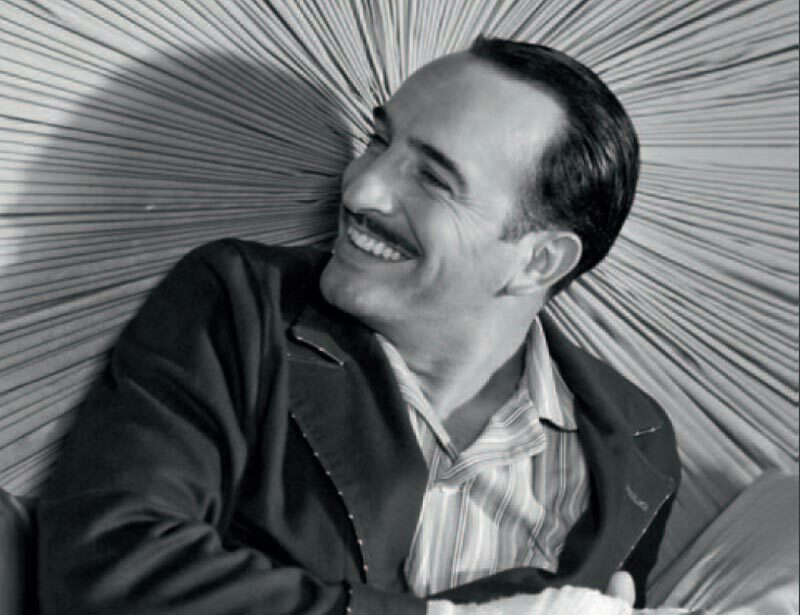 Michel Hazanavicius may talk about CITY LIGHTS (which is also not a silent film) as an influence, but as David Ehrenstein points out, SINGIN’ IN THE RAIN is a far greater influence than any 20s or 30s film, on the structure, the central performance and the whole perception of the subject. There’s also the ghost of A STAR IS BORN, and a conscious lifting from ANCHORMAN (arrogant successful man falls from grace — he has a dog so we’ll care), and that controversial VERTIGO borrowing (as incomprehensible to me now I’ve seen the film as it was when I heard about it). I wasn’t moved (and I ought to be an absolute sucker for this story), I only laughed a little, and the much-vaunted “charm” was authentic but only got me so far. Leading man Jean Dujardin is handsome and appealing and funny, and it’s nice to see him and his director stretch themselves beyond the repeating set-up/joke structure of the jolly OSS:117 films, but long passages of up to twenty minutes seemed devoid of any real dramatic or cinematic ideas, a problem when your story is as simplistic and one-track as this. This is a shame since the ideas-rich bits are often very good. When the protag becomes his own writer, producer and director, a multi-exposure montage causes a circular camera part to overlap his face, forming a Von Stroheim monocle. Anyone who can come up with that ought to be able to dish up a few more dog gags. But he does do a good ambiguous BANG! (above) — the intertitular equivalent of THE APARTMENT’s false alarm Act III champagne cork. The rest of the cast: Uggy is great (if outclassed by Skippy, the terrier who played Asta) and Berenice Bejo does well, despite not really looking like a 20s starlet. There’s not a lot of depth there, but I blame the script, not the actors or the constraints of pantomime. What’s weird is that James Cromwell and John Goodman, two very capable actors with strong physical characteristics, count for almost nothing — Goodman immediately peps up when he gets to speak, and shows signs of his skill in the scene where Bejo blackmails him, which again leads me to think that it’s the lack of business and lack of drama which hinder them. But maybe they’re just not silent actors. Imagining Doug Jones or Pierre Etaix in the Cromwell role immediately unlocks possibilities untapped here.